It's an old-fashioned Scottish witch-burning in Cindy Spencer Pape's 5th Gaslight Chronicles story, Cards and Caravans. Note: Cards and Caravans is the fifth story of the Gaslight Chronicles series. While the stories work well as stand-alones, there are inherient spoilers, especially where the romances are involved. Belinda Danvers would never harm innocent children to settle a grudge. Never mind that Alderman Douglas seems to think that just because she's a widow she should appreciate some male companionship. And nevermind that the vicar's wife had a bad reaction to a skin creme she'd made. It doesn't take witchcraft to cause a cholera outbreak; tainted wells have been doing that quite handily since the beginning of time. But when the witch-finder comes to town, it's one kangaroo court from accusation to execution by fire. Connor MacKay has bid a hasty retreat from London. Still heartbroken from being turned down by Wink, he's back to his family's stomping grounds in Scotland and working as a field investigator for the Home Office. It's here that he receives a phone call from a concerned carnival worker. It turns out Belinda's great-aunt was reading the cards for her, and saw something terrible. It would put their minds at ease if Connor would check in on her and make sure things are going well. After a daring rescue, and finding sanctuary at the MacKay estate, the two of them must draw out the people who accused and illegally tried Belinda if any magic user - or unfortunate widow - will be safe. To do that, Connor and Belinda will have to call in the reserves, in the form of the carnival where Belinda grew up. A group of Romany using their small magical powers behind the flash and extravagance of the carnival should be too much for this anti-magic group to pass up. Cindy Spencer Pape blends aspects of romance, fantasy and the Victorian era to create her stories. The reader genuinely cares what happens to her characters, and people who might have been long gone in another series have a tendency to reappear, much to the delight of fans. Those who have read the other books in this series should be sure to pick this one up, and while a newcomer would find all she needs in this book to enjoy it on its own, she might be better served by beginning at the beginning and getting to know the families involved with Steam and Sorcery. Highs: The interaction between Belinda, Connor and Wink are spot-on, and priceless. Lows: The ghost of Belinda's husband hanging on, while making for a few touching scenes, seems a bit tacked on. 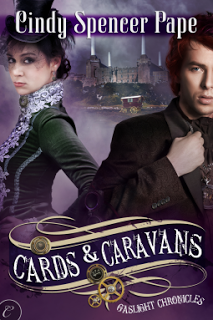 Verdict: A lovely romance wrapped in layers of mystery and adventure, and held up by a rich backstory, Cards and Caravans is one of the better Steampunk Romance series on the market.